If you want to enhance your appearance and have smooth skin that is blemish free, stop wasting money on overpriced chemical cosmetics and consider the skin benefits of juicing. Freshly made raw juices can have a remarkable effect on your skin’s tone and texture over time. This is not a quick fix. But if you want to have perfect skin, the only long-term way to do it is from the inside out and it all starts with your liver. Your liver is one of the most essential organs in your body. It performs more than 300 critical metabolic functions related to either transforming or eliminating substances within your bloodstream. With tens of thousands of man-made chemicals polluting our environment, water and food, and over 700 contaminants in the average American body at any one time, your liver is working harder than ever before. Burdened with trying to eliminate an ongoing stream of chemicals and other toxins, it recruits your skin to help with the process of detoxification. Now, instead of receiving the nutrients and vitamins your skin needs to look its best, it is sent more and more foreign and often toxic compounds to get rid of. 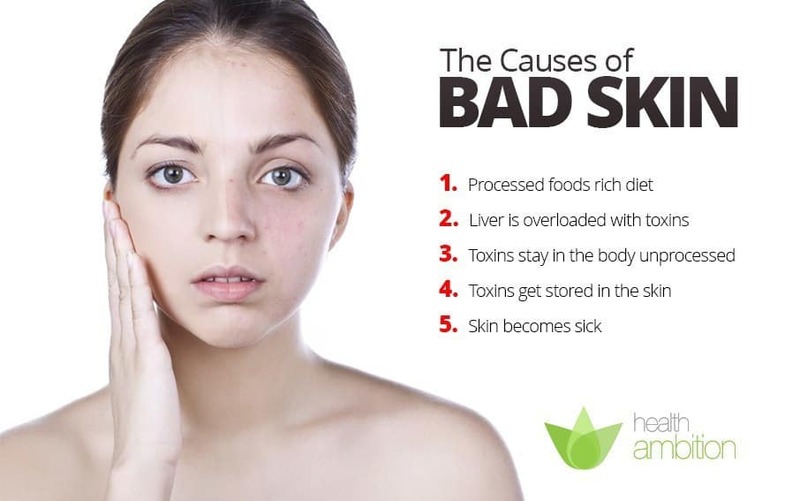 It’s hardly surprising that trying to process out these substances often leads to inflammatory skin diseases like dermatitis, eczema, psoriasis, adult acne, liver spots and rashes, along with dry and dull skin and premature aging. While there can be other causes of skin problems such as hormonal imbalances, many of these issues would improve or disappear if the liver wasn’t so sluggish and overburdened. So if the liver is the key for how to get perfect skin, then how can you begin to heal it? More water, less processed foods and alcohol and regular exercise are all highly beneficial, but one of the most powerful ways to enhance your liver’s health is with homemade fresh juices. Commercial fruit juices have most of their best skin vitamins and other nutrients processed out of them and are full of sugar. Supermarket orange juice for instance can have as many simple sugars as a can of Coke. Drinking commercial juice can be incredibly taxing on your liver and is definitely not good for your skin in the long-term. On the other hand, when you extract the raw juice from liver friendly vegetables and fruit like carrots, beets and apples, you have a concentrated shot of cellular cleansing, liver regeneration and healing for your skin. Carotenoids such as alpha and beta-carotene found in juicing vegetables like carrots, kale, bok choy and collard greens. These antioxidants protect your skin from inflammation and the breakdown of collagen that leads to wrinkles and other signs of skin aging. Phytonutrients like the betalains in beets, quercetin in apples and glucosinolates in cruciferous vegetables and leafy greens have a rejuvenating effect on your liver cells and help speed up detoxification, thus lessening the burden on your skin. Minerals are also important for your liver and therefore your skin’s health. Most of the processed foods in the supermarket shopping aisles are stripped of minerals in their manufacturing. Many of them, like soda and other high sugar and acid products, actually leech minerals such as magnesium and calcium from your body. By comparison, fresh juices are full of potassium, calcium, magnesium, natural sodium and other minerals needed for proper liver function. Juicing also delivers a variety of trace minerals including iron, selenium, manganese, copper and zinc, all of which are necessary in various ways for achieving skin that is smooth and blemish free. Vitamin C is especially important in the quest for perfect skin. It is found in high doses in broccoli, kale, pineapple, kiwi, papaya, strawberries and citrus fruits. Without a good regular intake of vitamin C your body can have trouble maintaining the connective collagen that helps keep skin soft and subtle. Over time, a deficiency in vitamin C is associated with fine lines, wrinkles and other signs of accelerated skin aging. B vitamins also play their part in maintaining healthy skin and deficiencies in niacin and B6 in particular can have a big impact on your skin’s appearance. Vegetable juice is usually a better way to get B vitamins than fruit based juices. Leafy greens and cruciferous vegetables can additionally be a source of pro-vitamin A, vitamin D and vitamin K. As these are fat-soluble vitamins it’s important to take some healthy fats around the same time for best absorption. A tablespoon of extra virgin avocado oil with your juice is particularly good for this and contains monounsaturated fats that aid in skin smoothness and moisture retention. Carrots are a powerhouse of antioxidants, vitamins and minerals. Many people who start juicing carrots regularly notice a healthy glow to their skin and an improvement in its smoothness and texture. Beets are one of the most effective liver cleansing vegetables available and beet juice is even said to help regenerate damaged liver cells. 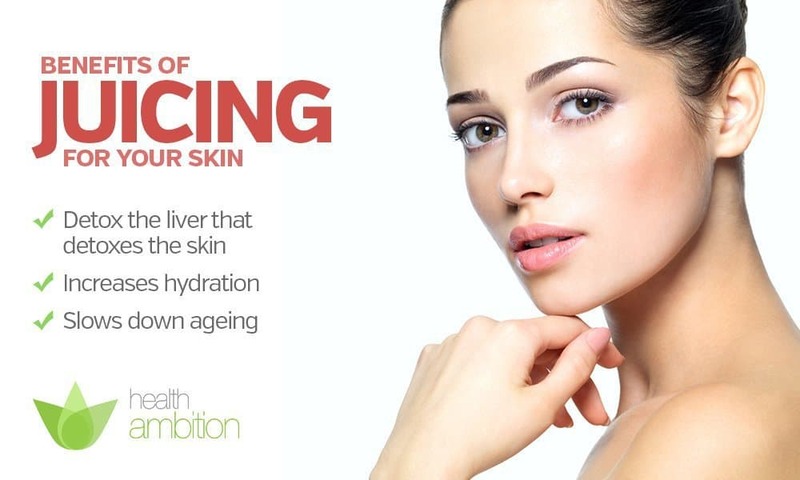 In the long run, anyone looking for how to get perfect skin cannot ignore the importance of the liver. Drinking fresh beet juice mixed with other vegetable juices regularly is one of the simplest ways to heal this vital organ. 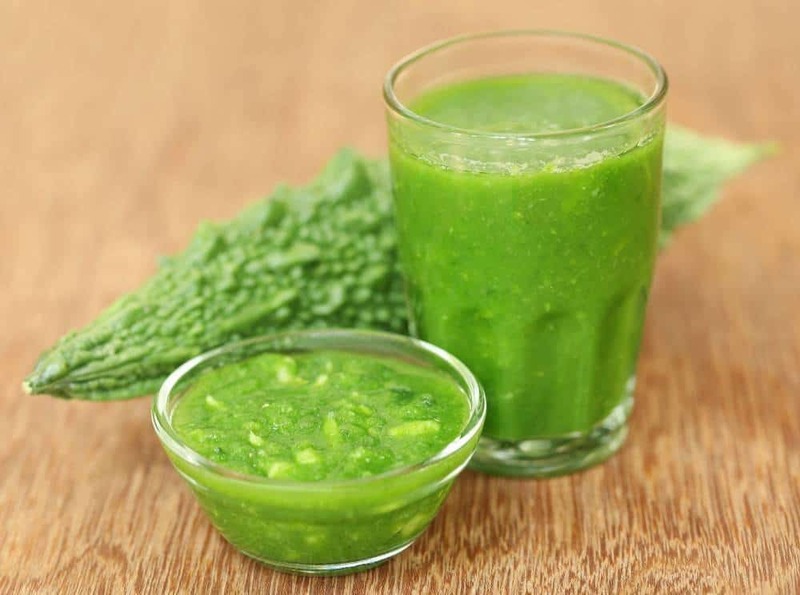 Celery juice is highly cleansing, alkalizing and detoxifying to your body. It is especially rich in silica, a trace mineral needed for beautiful skin and healthy hair and nails. 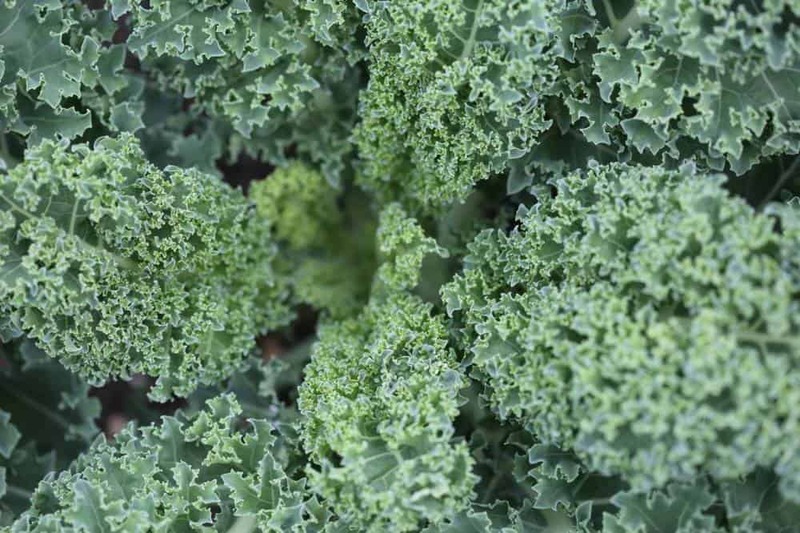 Kale is one of the most nutritionally potent vegetables available and definitely benefits your skin with its off the chart levels of vitamins, minerals and phytonutrients. Unfortunately, cheap juices aren’t very good at juicing kale and other leafy greens, so you’ll need something like this if you want to get all of its skin nutrients into your cup. Cucumber is an extremely hydrating, cooling and alkalizing vegetable for eliminating toxins. It is high in silica and other beneficial trace minerals for reducing inflammation and improving the softness of your skin and the strength of your hair and nails. Pineapples are a sweet and delicious source of antioxidants like vitamin C for better skin. It’s important to juice pineapples with their cores as this part contains the enzyme bromelain which helps breakdown undigested proteins – a potential source of liver stress and skin problems. Tomatoes are classed as a fruit and their juice is rich in the skin protecting antioxidant lycopene. Also highly beneficial for your heart, tomato juice is especially good to have before going out in the sun for long periods as it helps protect your skin from UV damage. Papaya juice is a tropical tasting shot of vitamin C, vitamin E, lycopene, beta-carotene and various minerals and micronutrients.Papayas also contain a similar digestive enzyme to pineapples called papain that assists in breaking down inflammatory foreign proteins. Highly recommended for soft and beautiful skin. Lemon juice has many health benefits, including assisting digestion, detoxification and elimination, providing alkalizing minerals and antioxidant vitamin C and helping your liver to produce more bile to digest fats. All of these end up aid in your skin in the long run, but it is particularly beneficial in your juice to prevent oxidization of other fragile juices like apple and cucumber. 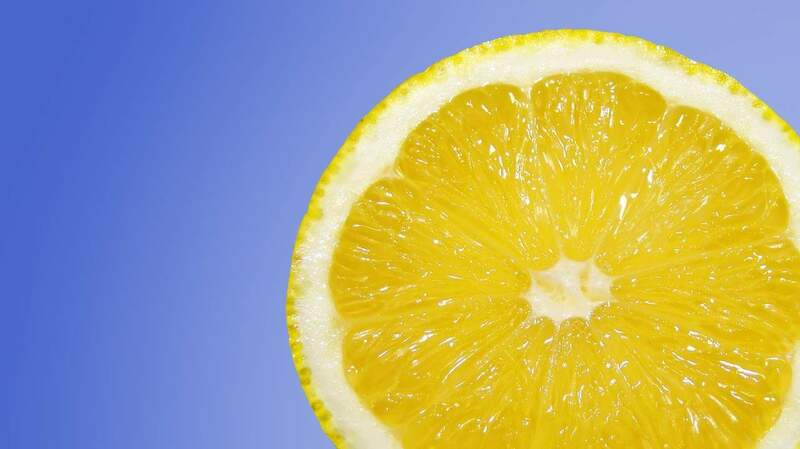 It’s recommend to juice a lemon first with a citrus juicer and add the resulting liquid with a couple of ice cubes to the bottom of your juicer’s collection container.This will really help in delaying the breakdown of the enzymes and other nutritional elements in the freshly extracted juice. Apple is actually an extremely healthy fruit, high in antioxidant flavonoids like quercetin, kaempferol and myricetin.These not only benefit your skin’s appearance, they have also been shown in studies to reduce the risk of skin cancer. Pectin in apples also helps your liver with eliminating toxins and apples natural sweetness can balance out the sometimes potent vegetable juice flavors.Incidentally, apple cider vinegar also makes a great cleanser and toner for your skin from the outside and is much better than chemical laden commercial cleansers. Here’s an interesting green juice recipe for clear skin. It can take some time, but juicing to heal your liver and fill your cells with concentrated nutrition is one of the best things you can do for your skin. It’s better to start off by making up fresh juices just once a day at most for the first week or two. Even a couple of times a week a beneficial, but ideally find 15 minutes during the day for a regular time for juicing and stick to it to make it a habit. Some people find juicing in the morning to be an energizing way to start the day. Others prefer making up a fresh juice soon after they get home from work. This can help avoid snacking before dinner and recharge your batteries after a long day at the office. Juicing diets and fasts where only freshly made juices are consumed for several days have become a popular way to lose weight and detox the body. If you decide to embark on a program like this it’s recommended to follow a detailed plan like the Ultimate Juicing Guide, which teaches you the intricacies of doing a juice fast properly and helps to minimize potential side effects of detoxification. Be aware that detoxification reactions can happen when you start juicing, particularly if you’ve eaten a largely processed food diet up until this point. Your body, and your liver in particular, finally has a chance to start getting rid of stored toxins and this can manifest in tiredness, headaches and even temporarily in an increase in skin breakouts. Starting off at a slower pace and increasing the amount of fresh juice you drink over several weeks, rather than going straight into a juice only detox, can help to minimize any side effects. Drinking more water, gentle exercise and eating more vegetables can also help to avoid detoxification problems. 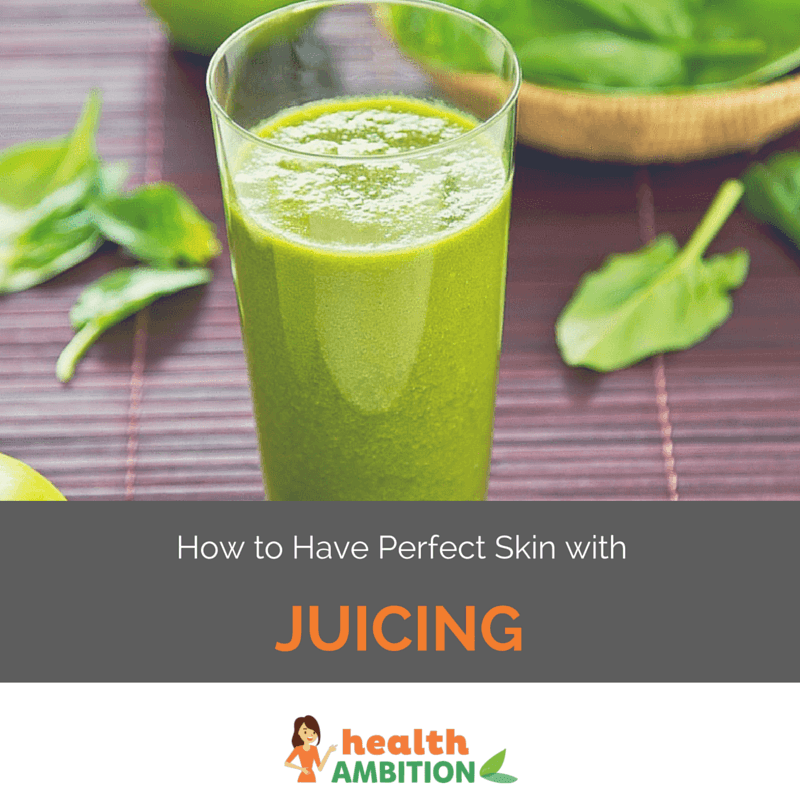 Any of the fruits and vegetables mentioned above are ideal to juice for improving your skin and this page on the best vegetables for juicing has some other great options. The general rule is that blends are better and the more different vegetables and fruits, the broader the range of antioxidants, minerals and vitamins in the juice you’re drinking. These raw juice recipes also have detailed instructions for juices targeted specifically at liver detoxification and improving your skin tone. Another great blend is this carrot, apple and beet juice liver tonic and there are many more recipes for juicing available on Health Ambition. One of the fun parts of juicing is experimenting and coming up with your own fresh juice blends. Feel free to share any of your favourite recipes in the comments below. Remember though to not just focus on the sweetest fruits. Generally, vegetable juices are more powerful than fruit juices and have a greater impact on both your liver and your skin. Once again, juicing isn’t a quick fix. It takes time for new healthier skin cells to be generated from the higher levels of nutrition you are now putting into your body. In the long run though it’s one of the best ways to smooth, blemish free and beautiful skin. Tastes: Powerful, like super fresh veggies. This juice recipe is a rich and satisfying blend of flavors and loaded with skin benefits. I’d recommend giving it a try, even if you don’t normally like some of the vegetables listed above. When you see the effects on your skin, you’d keep coming back for more. Healthy fact: Celery juice is especially rich in silica, a trace mineral needed for beautiful skin and healthy hair and nails. I am so looking forward to clearer skin as a result of juicing. I started juicing this past Sunday and have had a few more breakouts this week but I have noticed a big difference in my appetite being suppressed and energy level up. I am looking to juice for weight loss specifically but also to improve my nutrition, skin and overall health. I just had a recent skin cancer scare and heard that most skin cancers in places that never see the sun are a direct result of diet. Thank you so much for this information. It’s the best I’ve found so far!! Thanks for your positive comments. You’re right that there are a lot of different health benefits of juicing including moderating appetite and improving energy levels. Aside from improving the appearance of your skin, the antioxidants in these kind of juicing recipes would also help provide protection against free radical damage that is implicated in skin cancer. My son has very bad acne on his back. Ive had him on medication for 6 months & it cleared up over the summer but now its back worse than ever. I have tried creams, sprays, soaps and nothing works. Is there juice you can recommend specifically for acne. Hi Adele. The recipe in this article or a similar variation should help internally. Externally many people in online forums have more success with natural ingredients like this parsely face mask http://superfoodprofiles.com/parsley-face-mask-acne-dark-spots-discolored-skin They can actually be far more powerful as they don’t need to be stabilized for long shelf life and have far more active ingredients. i am become bit fat i want to lose my weight and become to fit and i also want fresh skin which fruit can i need plz told me?